This is the latest addition to meet our mission and reach an audience that currently has limited opportunities to engage in the community while learning skills related to self-reliance, nutrition, land stewardship, and food security. The Learning Garden Program had its first run in the summer of 2017 led by an AmeriCorps VISTA. Our first VISTA hosted various youth groups from Big Sky Youth Empowerment (BYEP), the YMCA, and the Fort Peck Reservation. The youth were engaged in educational gardening activities and volunteer projects that supported GVFB. In the summer of 2018, another VISTA and two MSU interns developed and implemented nine weeks of programming with four at-risk youth, ages 13-16. They recruited kids through youth probation, school counselors and BYEP’s waiting list. The summer programming included gardening, cooking, volunteering in the food bank & serving summer lunch at Beall Park. The kids benefited from the program by having a safe space with mentors & a counselor, having access to healthy snacks & weekly food boxes, educational opportunities and physical exercise. Their combined attendance & service totaled 340 hours. The Story Mill Community Park & Learning Garden will be constructed by Spring/Summer 2019. It will be a community gathering space and educational hub in Bozeman’s largest city park. 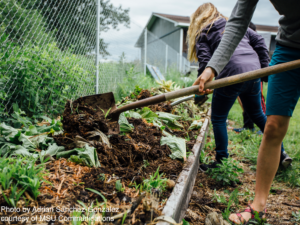 Our vision is to create a healthier, more resilient, food-secure community in which all of the members are empowered and have the means to nourish themselves. Our mission is to cultivate an environment of community-driven education, agricultural stewardship, environmental awareness, and food sovereignty. By developing new partnerships, offering volunteer opportunities, and creating a dynamic space where educational programming and workshops can occur, we believe our vision can become a reality. The process of building and implementing this program will take a team of committed individuals. 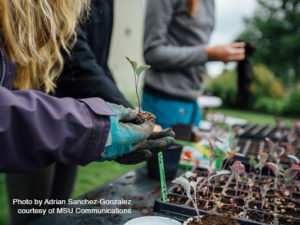 For the 2019 & 2020 growing seasons, our VISTA will serve as the capacity builder and will lead in bringing partners to assist all aspects of programming. The workload will be broken into specific internships that focus on the tasks of teaching, counseling, soil improvement, and farm management.